The latest release from Nelson da Silva and Johan Axlund’s Vinedrops label and perhaps the best yet. 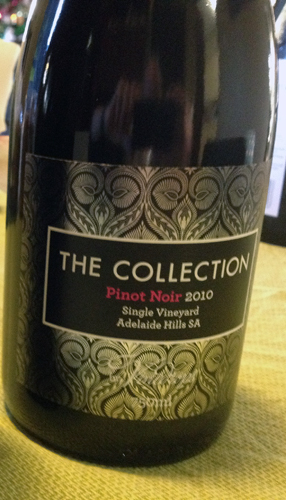 It’s a juicy, fruit driven Pinot built simply and openly. Commercial appeal +. (Footnote: Nelson is a friend so I’m willing to take any accusation of bias. Still think this is the best wine of his releases so far). Nice collection and wine gift for this coming holiday season. I hope my friends will like it too. I met Nelson at a Berowra Food and Wine outing, really impressed with his taste in wine and much of his 'collection' was rather good. I enjoyed the Pinot (not sure if 09 or 10), and the price is right!! Will revisit! Mind you that first post smells of a processed pork product. Possibly more poor form by a marketing company similar to recent Howard Park spam?? Glad you liked the wine TiggerK, yes it was also the 2010. It's just starting to find it's straps with 3 months in the bottle. We're really happy to get a good Pinotever everyone to enjoy at such a great price. Wine lover, we agree, they're great looking bottles for Christmas gifts. There's certainly some bottles under peoples Christmas trees already.